IMF boss Dominique Strauss-Khan: "We need Greece... back on track"
The head of the International Monetary Fund has warned that the crisis in Greece could spread throughout Europe. 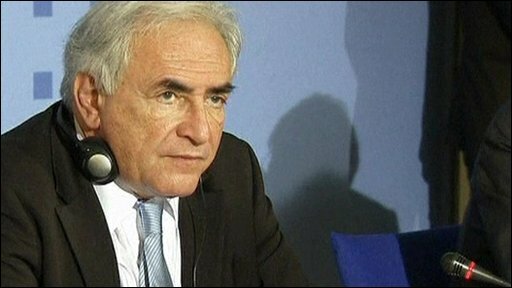 Dominique Strauss-Kahn said that every day lost in resolving Greece's problems risks spreading the impact "far away". World financial markets, recovering slightly on Wednesday, have been badly hit by fears of contagion from Greece. Mr Strauss-Kahn was speaking at a news conference in Berlin after trying to persuade reluctant German politicians to back the terms of a rescue deal. But even as politicians were trying to resolve the crisis, Europe's debt problems were flaring elsewhere. We now enter an uncertain period. Will the financial markets test Portugal or Spain? The Spanish economy is five times the size of Greece. Will other bail-outs be needed and would the German taxpayer revolt against helping out others? The Standard & Poor's ratings agency delivered more bad news by downgrading Spain's debt to AA from AA+. The agency said Spain's growth prospects were weak after the collapse of a credit-fuelled housing and construction bubble. Mr Strauss-Kahn's comments foreshadowed S&P's news. "What is at stake today is the economic situation of Greece. But it's more than that. "We also need to restore confidence... I'm confident that the problem will be fixed. But if we don't fix it in Greece, it may have a lot of consequences on the European Union," Mr Strauss-Kahn said. Mr Strauss-Kahn, and European Central Bank president Jean-Claude Trichet, were in Berlin to urge German MPs to agree to a rescue deal under which Greece would get billions of euros in loans. For me personally, it's getting to be a real possibility that I may need to leave this country. We may see a new wave of people leaving, particularly young people, especially if our salaries decrease. German Chancellor Angela Merkel said that talks on the bail-out package must be sped up. "It is perfectly clear that the negotiations with the Greek government, the European Commission and the IMF need to be accelerated," she said after meeting Mr Strauss-Kahn. "We hope they can be wrapped up in the coming days," she said. But many German politicians are opposed to the bail-out of Greece, and Mrs Merkel has herself been accused of offering only qualified support. Germany is facing elections, and with public opinion against giving billions of euros to Greece, Mrs Merkel must tread a fine line. As Europe's largest economy, Germany would provide the biggest single loan to Greece among the eurozone nations. The aid package being offered by the EU and IMF is currently 45bn euros ($59bn; £39bn). But support for the bail-out in Germany will not be helped by claims that the total cost of the proposed package could be up to 120bn euros over three years. After meeting Mr Strauss-Kahn on Wednesday, the leader of Germany's Green Party, Juergen Trittin, said the aid could total "between 100bn and 120bn euros". Financial markets continued to be hit, following credit rating agency Standard and Poor's downgrade of Greek debt to "junk" on Tuesday. Greece crisis: What can be done? Could UK face same fate? This means the rating agency views Greece as a much riskier place to invest, and increases the interest rate investors will charge the Greek government to borrow much-needed money on the open market. On Wednesday, that interest rate hit 11.3% for 10-year Greek bonds - another all-time high for a eurozone country. Interest rates on two-year bonds hit a new high of almost 19%, later falling back to 16%. The euro hit a one-year low against the dollar of $1.3146. European stocks also fell sharply on Wednesday, although they recovered some of their losses in afternoon trading. Overnight Japan's leading share index, the Nikkei 225, closed down more than 2.5%. The turmoil forced Greece's stock market regulators to impose a ban on short-selling, amid concerns that bank shares are being undermined by speculators. Concerns about the Spanish and Portuguese economies also intensified following the downgrade by S&P. Spain's deputy prime minister, Maria Teresa de la Vega, appealed for market calm, telling reporters: "We have a very serious plan of... deficit reduction. We have adopted an austerity programme. "We are adopting all the measures needed to meet our commitments. So I want to send a message of confidence to the population and of calm to the markets," she said. Mr Strauss-Kahn also urged caution in the face of the downgrade. Ratings agencies "are reflecting what they are collecting in the market.... One should not believe too much what they say, even if they are useful," he said. But even before the downgrade investors were turning negative on Spain. Yields on Spanish 10-year bonds reached their highest level - 4.27% - since the euro was launched. Meanwhile, investors are demanding an interest rate of close to 6% from Portugal. "If yields rise much further Portugal may, like Greece, be in a position where [borrowing] on the open market becomes just too expensive," warned Jane Foley, research director at currency trader Forex.com. Portugal's Prime Minister Jose Socrates spoke of "a speculative attack on the euro and Portuguese debt". He said he would work with the opposition party to restore economic confidence in the country which also had its credit rating downgraded on Tuesday. According to Simon Derrick, from Bank of New York Mellon, time is now running out for Greece to secure a deal. "The message that has been emerging from the markets this week is that a resolution to the Greek crisis needs to be found in the next few days," he said, warning that delays risk "sparking contagion through southern Europe". How did Greece get into this situation? What are the ways out for Greece? Could UK face the same fate as Greece? Peston explains: What are junk bonds?